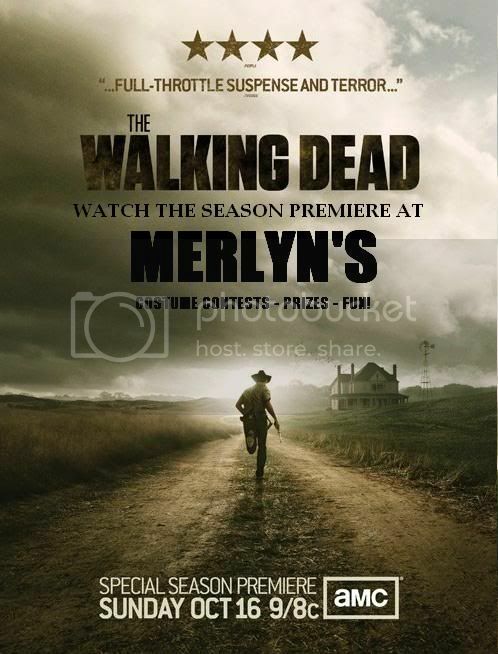 Merlyn's has just received copies of Robert Kirkman's The Walking Dead, based on the comic book series, NOT the TV show. In fact, there will be a version of the TV show later this year. The best part? You can play ONE - 6 players. It contains original art by Walking Dead artist Charlie Adlard and the game allows you to play people from the comic series like Rick, Shane, Dale or Andrea as you attempt to be the first player to successfully scout out three possible safe zones. 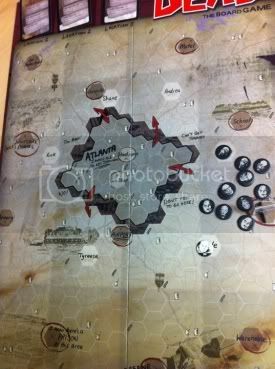 The game board is a map of northern Georgia with the city of Atlanta at the center and various locations in the outskirts. 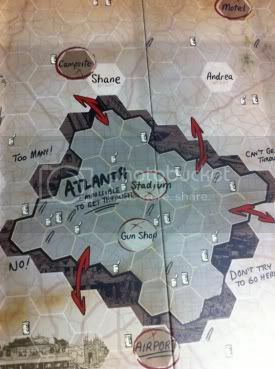 Player characters have designated start positions outside Atlanta and begin the game with 1 of each type of resource. Those being food, ammo, and gas. Dotted throughout the map are also various resource markers that players can attempt to collect. Each player will then randomly draw one of six starting characters and one follower from a deck of 23 eligible. Each character and follower (also referred to as survivors) has a special ability and a die or set of dice representing their contribution to fighting and skill challenges. There are 4 types of die in the game; 4 blue "hero" dice, 4 red "warrior" dice, 4 green "scavenger" dice and 1 black "ammo" die. As a player accumulates followers their die/dice are contributed to a total roll increasing the players odds of succeeding at challenges or winning in combat. Basically reflecting that there is better success and safety in numbers. Each colored die as a set number of either baseball caps for determining challenges, zombie heads to determine the number of zombies killed in combat, and wild symbol which can represent either. The black ammo die has only zombie heads and is used when a player opts to use ammo to assist in killing zombies. You can then move up to three spaces, rolling dice based on your assigned attributes to deal with all encounters. But beware - every time you leave a space you must place a zombie token in that spot. 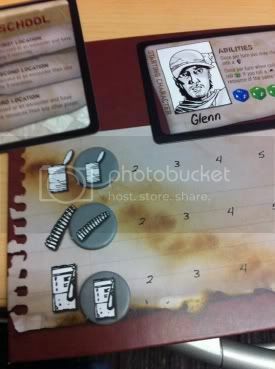 As you can see, Glenn (above) is making his way to the mall, but is leaving a wake of nasty zombie-ness. 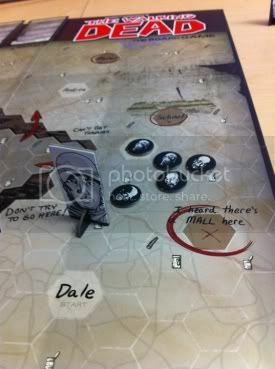 The more people to play the game, the more quickly the board gets covered in rotting black swarms of zombies. Also needed to survive in the game? Supplies. Namely gas, food and ammo! Combat is direct and simple you roll your dice pool and try to equal or exceed the number of zombies encounter. After this roll and you do not succeed you can play one ammo resource and roll the black die. If you still do not succeed you can play yet another ammo and roll the black die again. Failure to the kill all the zombies means you will suffer damage equal to the number of surviving zombies. These are called fatigue markers in the game and any survivor that receives 3 of these is killed an removed from the game. A player can distribute fatigue/wound marker to themselves or to any of their followers. Using the black ammo die has its disadvantages though, anytime you roll and get the "blam" the sound of the gun attracts zombies and a zombie marker is placed in every adjacent hex to the player. Atlanta itself (above) is full of useful supplies, but it's also a fiendishly perfect place to get trapped as you can see that there are only a few spaces that allow you to enter and/or exit. Scouting locations becomes progressively difficult as the game evolves. 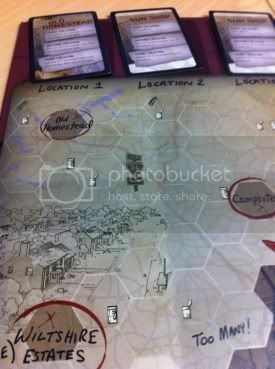 Each location card lists the challenges based on what order it is scouted in. If the first location has already been scouted by a player then the next location would use the second location for scouting and so on. The nice thing about the game is that you can play a session in under an hour and because luck is involved, no one person dominates the game. 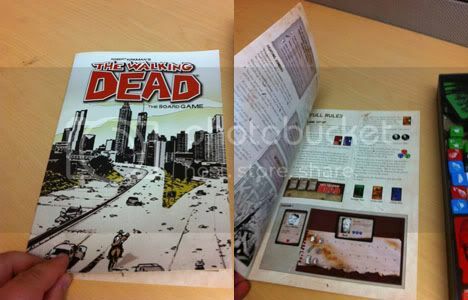 The game board itself is canon to the comic series and actually had to be approved by Robert Kirkman himself. 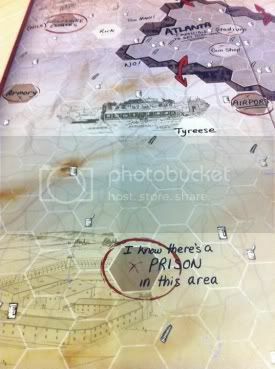 It represents how Kirkman sees the layout of the areas he's written about and it's the first time anything from the comic has been officially mapped out. 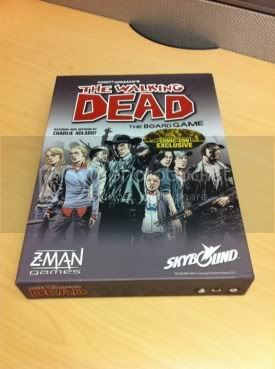 This is the perfect game to try out before our big WALKING DEAD Season 2 premiere party on October 16th.